From left, First Selectman Mike Tetreau, Megan Henry, a FWHS junior, FWHS Art Teacher Margaret Capron and Ethan Larkin, a FWHS senior. 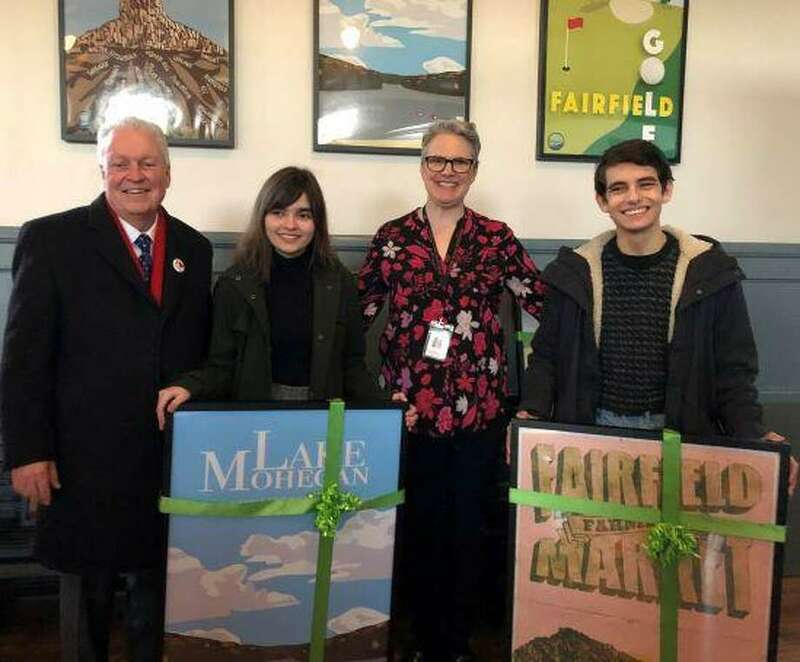 The Parking Authority of Fairfield recently held a ceremony at the downtown train station to showcase the second phase of Fairfield Public Schools student art work created for both station houses, First Selectman Mike Tetreau said. The first phase of the project was completed last spring when Fairfield Ludlowe High School (FLHS) student artwork was displayed inside the New York-bound station house. The second phase features artwork created by students from Fairfield Warde High School (FWHS) that is displayed inside the New Haven-bound station house. Attending the ceremony to celebrate the FWHS students were Parking Authority members Elise McKay and Nelson Heumann, Tetreau, District Art Department Coordinator for the Fairfield Public Schools Michele Hermsen, FWHS art teacher Margaret Capron, proud parents and many supporters. Additionally, student artist Abby McCabe created the Enriching education design. The Parking Authority of Fairfield had asked Michele Hermsen, District Art Department Coordinator for the Fairfield Public Schools, whether it would be possible to create student artwork for display at the downtown train station. As a result, four talented students in Margaret Capron’s Digital Illustration class took up the challenge to create pieces reflecting their vision of the unique aspects of the Town of Fairfield. Ms. Hermsen expressed her appreciation for the wonderful collaboration and support from the Town noting how its partnership with the schools helped make this project a great success.